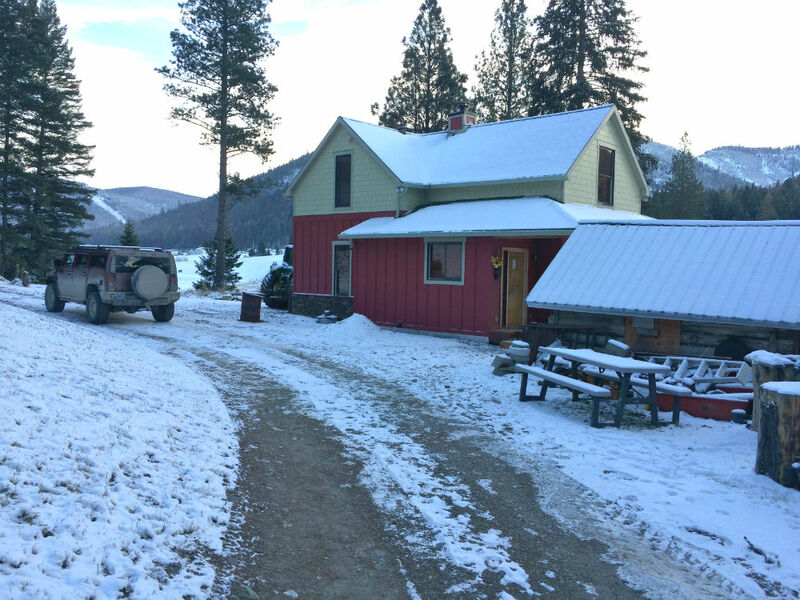 This is the third part of a series of articles on Stair Trim-Out in a remodel to a 100-year-old cabin built using vertical logs. The project was started by the homeowner and his friend, a carpenter, about four years ago. They replaced the main floor framing and the second floor framing, removed some walls, furred out others, and left some of the original walls exposed, as you can see below. Apparently the project took too long or the homeowner and carpenter grew tired of each other, and I was called in to finish the job. In general, they did a great job preparing the project for the finish carpentry work. But it's not just the existing carpentry that I look at when taking over someone else's project. My three areas of concern are the money, the schedule, and the expectations. There are two parts to the money issue. First, do the customers actually pay, and pay on time? Second, are they willing to spend what I think it's going to take to complete the project? In this case both answers were "Yes." After working on the project for four years, the clients wanted to see it come to an end, but they understood that the finish work is not the place to hurry things along, so the schedule I laid out was fine. Their expectations were high, but not unrealistic. We would be a good match. My primary job is to fabricate and install trim for the windows, doors, and stairs, but there are some specialty items, too. Besides the casing, extension jambs, and baseboard, the trim package includes skirt boards, newel posts, and some bead board in several locations. 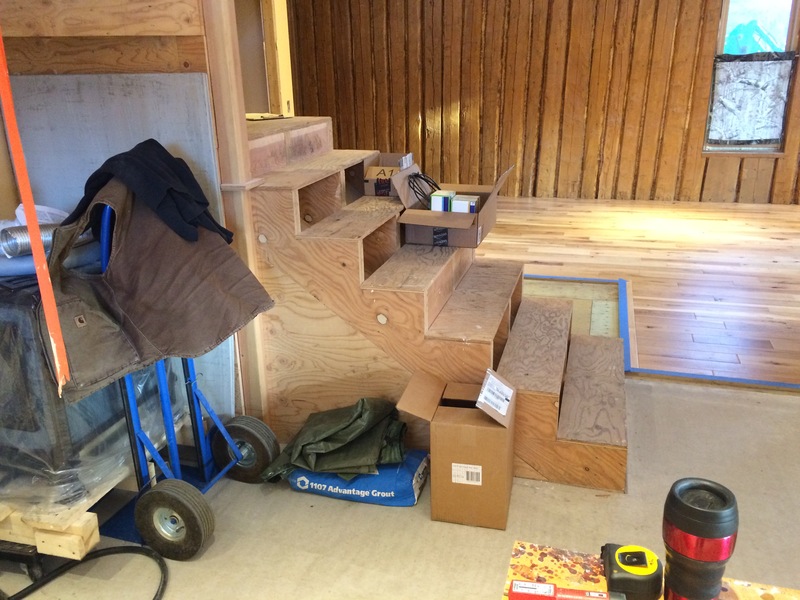 I also need to fit and install the factory-built stair treads, risers, nosings, and flooring. The railing will be metal, installed 'by others' after I am finished. But this series of articles is about trimming the stairs. I'll try to cover some of that other stuff in future posts. 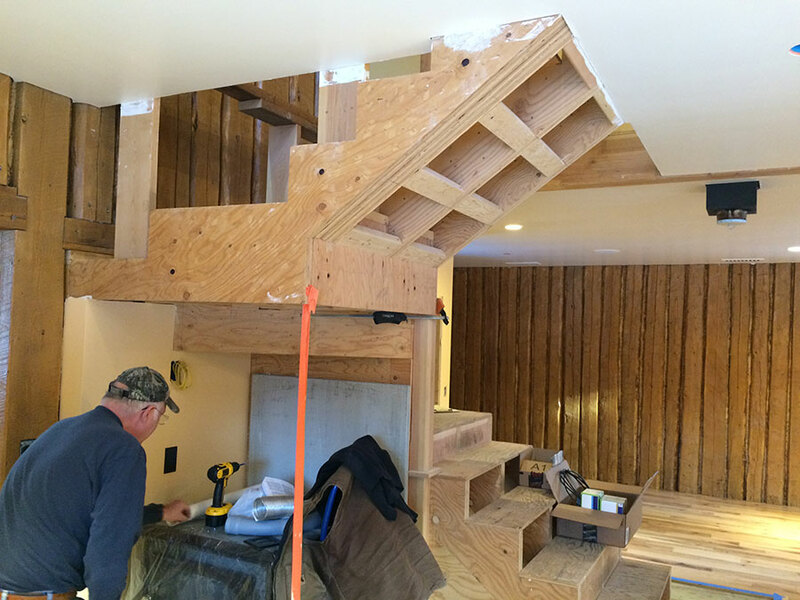 There are a couple of tricky parts to this particular stair trim-out, the first will be wrapping the 4x4 post that rises up through the middle of the stair assembly. The post is not quite centered, and the wrap is to be mitered, so that's tricky. It'll take a bunch of clamps, glue, and biscuits. 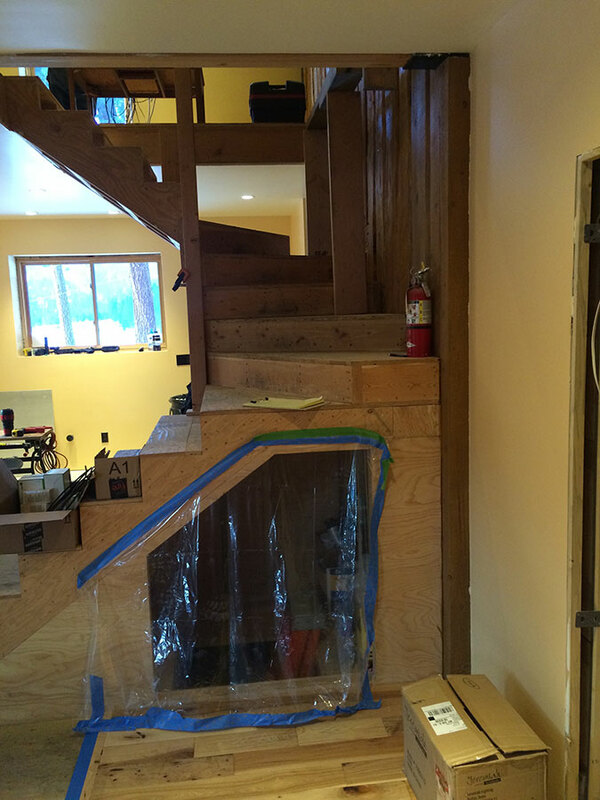 Another tricky part will be installing the nosings and flooring on the winder section of the staircase. This section is has six triangular shaped treads that are stacked on each other and connect the upper and lower straight flights. For the most part, this will be stain-grade work, but there is some pre-primed 1x4 tongue-and-groove bead board which will be painted by the homeowners. I'll use vertical grain Douglas fir for the casing, base, newel posts, and miscellaneous trim pieces. Doug fir is relatively abundant here in the west, it looks great, and is relatively affordable compared to other stain grade species. The extension jambs and skirt boards will be 3/4-inch vertical grain fir plywood. The treads and risers are hickory to match the flooring. While the skirt board stock is at the painter's shop, I will build the box newels.